No 23 Cecil Court, off London's Charing Cross Road WC2, used to be an antique shop owned by Louis Meyer. He had an assistant called Elsie Batten who was 59 years old. But on Friday 3rd March 1961 Elsie Batten was found stabbed to death in the shop. Raymond Dagg was a detective sergeant at Bow Street at the time, and when he interviewed Louis Meyer and a neighbouring shop assistant they told him that they had seen a rather suspicious youth of Indian appearance at the shop a few days earlier. But how would the witnesses describe the suspect? Raymond Dagg turned to America for help and used Identikit, which was then a new idea from the USA, originating from an invention by Hugh C Macdonald of the Los Angeles Police Department who had developed sets of facial features on transparencies to save time sketching descriptions of criminals in 1940 wartime Europe. Raymond Dagg compiled a facial picture of the suspect from Louis Meyer, and then, completely independently, from the other witness. The two pictures bore a striking resemblance to each other. The pictures were circulated and published in the Press. Identikit picture of the suspect On the following Wednesday 8th March Hilton Cole, a policeman from the next station West End Central, saw Edwin Bush in Old Compton Street in Soho just off Shaftesbury Avenue - and recognised him from the identikit pictures. He arrested him on suspicion of being the murderer. Bush had a copy of the identikit pictures from a newspaper in his pocket. His shoes were similar to marks left at the scene. He was picked out at an identification parade by one of two witnesses, - and confessed to the murder. He had also stolen a dress sword from the shop and had tried to sell it at a nearby gun shop. The paper in which the sword had been wrapped had been used to wrap up some goods bought by another customer at the gun shop and Bush's palm print was found on that paper when it was recovered by police. Bush was later convicted and was executed on 6th July 1961 in Pentonville prison. It was the first use of identikit by Scotland Yard. Identikit was, in due course, replaced by Photo-FIT , a system invented by Jacques Penry, a facial topographer who had been researching the subject since 1938, before Identikit was developed. 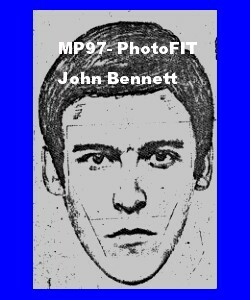 Penry used photographs of facial features, which gave a better image of the suspect's face, rather than the line drawings of Identikit. 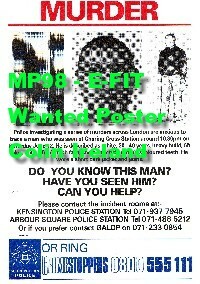 Photo-FIT was first used in relation to the murder of James Cameron in Islington in October 1970, where the Photo-FIT of the suspect was broadcast on Police 5 on 22nd October 1970. The resulting publicity jogged the memory of a shop assistant who recognised a man who had bought an umbrella from his shop in Victoria with a cheque which had bounced, but the man had produced a firearms certificate to verify his identity, and this led to the arrest in Nottingham of John Ernest Bennett who was convicted of the murder. As technology and computer systems developed further, the current system in use is E-FIT, launched in October 1988, and now developed and marketed by Aspley Ltd. It allows an operator to draw on a library of features stored within the computer, and then alter features, using special software, to match a witness's description. An early triumph for the system was the arrest of Colin Ireland, who was convicted of a series of murders of gay men in London. On 21 July 1993 Ireland gave himself up to police after seeing a police E-FIT image on a wanted poster, and whilst he initially gave a false explanation of his contact with one of the victims, Emmanuel Spiteri, he changed his story and confessed when he was told that his fingerprint had been found at the scene of another murder in the series.